In my early career, (before migrating to Australia) I worked in the heart of the London, commuting into Oxford Street on the city's most celebrated underground system, the Tube. Despite daily experiences of horrendous peak hour human traffic on public transport, countless train delays, and the occasional bomb threat, I have such fond memories of this time. I reminisce a work hard / party hard lifestyle in one of the most happening cities in the world, in my early 20's. London was the place to be. During my lunch break, I'd meander through some of the back streets of the West End, browsing boutique shops and department stores, partake in a spot of window shopping, and stop by Marks and Spencer for my takeaway sandwich and packet of Percy Pigs to take back to my desk. One place that I loved to visit during my hour of office freedom, was the pedestrianised shopping street, Carnaby Street, in the district of Soho. The late 1990 and early 00s was probably not the most memorable time to visit the iconic street, but one of the reasons I'd enjoy exploring this particular parade of shops and eateries, was to imagine what it would've been like in its heyday. 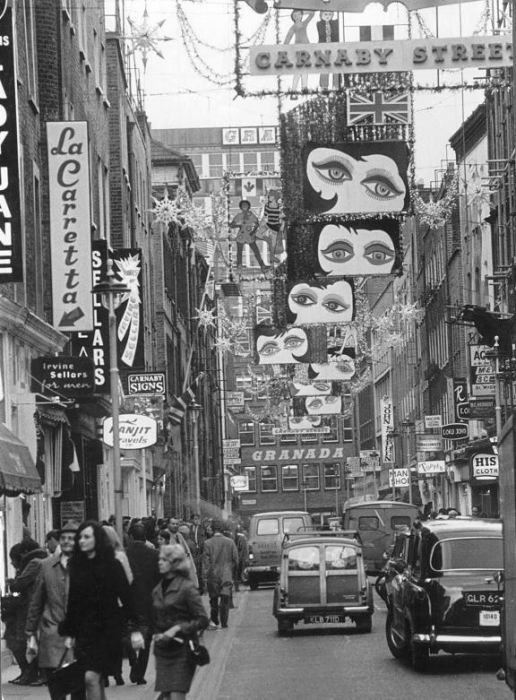 Carnaby Street in the 1960's. 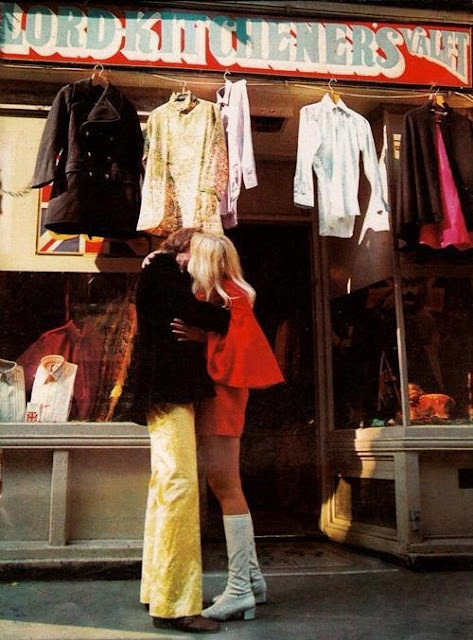 My parents, living and working in central London in their late teens and early 20's, have colourful memories of the fashion scene in Carnaby Street during the 60's. 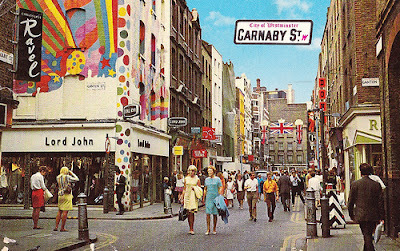 Mum tells me: "It (Carnaby Street) was very colourful and a happy place to visit. 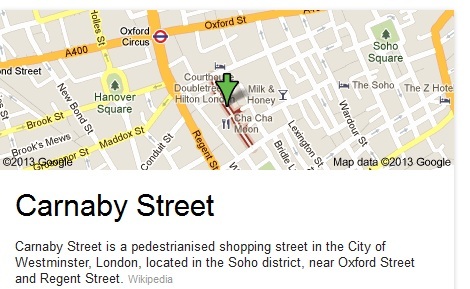 There were all the little side streets that transformed the area into a buzzy place to be. 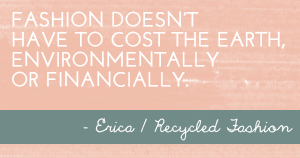 I can remember a friend of mine buying an electric green mini dress, with bat wings sleeves. The colours were so vivid - lemon or electric lime green, and it cost a fortune at £9.19s 11p, (that's old money, pounds and shillings) that was more than 1 weeks wages at the time!" Dad remembers: "High collared tab shirts that were floral and also satin, and all very colourful. Hipster trousers with very flared legs, and huge bell bottom trousers. The men wore high healed Cuban shoes. Also very popular were military jackets of all description (if you could find a real military jacket you were god!). Kipper ties with made from the same fabric as the shirt; paisley. Anything colour floral or stripey was worn. 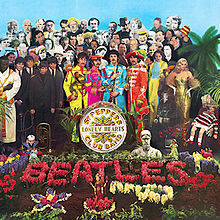 Look at the cover of Sargent Pepper Lonely Hearts Club Band by The Beatles, you will see the style of clothes at the time. It could also have been the first time loud music was played from all the shops.. happy days" he says. If time travel were possible (ha, ha!) which era, and place would you like to go back to? I love all things retro so I would say 1950's to early 1960's. From a fashion point of view, clothing from that era was beautifully tailored. Women looked divine and the men tended to be a match in the sartorial stakes.My uncle was a tailor during that era and he made my father the most amazing suit which he still wears to this day. The workmanship was extraordinary and my heart fills with pride when I see my father wearing his suit. It is timeless and I realize what a dashing young man he would have been in his day. I myself have a favourite pair of original Ray Ban Wayfarers that I found in a thrift store approx 10 years ago. Paid $25(which then was a lot of money for a thrift store purchase) and had the normal lenses removed and prescription sunglass lenses put in. I still wear them today so it was $25 well spent. But I love your post nonetheless. 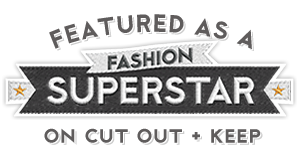 A really nice look into the fashion of the past. Have you ever seen the movie Smashing Time? This sums up the place and the era perfectly. Hilarious too!